Overview... a Cuban fisherman who has gone 84 days without catching a fish. Little does he know, Santiago is about to embark on the greatest voyage of his lifetime. Alone in the gulf stream on his small skiff, Santiago finally catches something on his line. Now the question is: can he actually land the giant fish? Personality… quiet, self-sufficient, and interconnected with nature. Santiago is more of an “animal” than other humans, in the best sense of the word. He understands the sea and its inhabitants better than he understands people on land. He often prefers to go fishing alone, and this allows him to admire the sea as not only an observer, but to feel a part of its ebb and flow. Santiago's popularity ranking on CharacTour is #3952 out of 5,000+ characters. See our top-ranked characters and read their profiles. 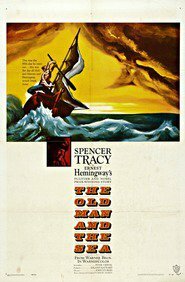 Based on one of Hemingway's most famous works, it centers upon Santiago, an aging, down on his luck Cuban fisherman. After catching nothing for nearly 3 months, he hooks a huge Marlin and struggles to land it far out in the Gulf Stream.